This post is sponsored. I received the product for review, as well as compensation for this post. As usual my opinions are all my own. I research companies before I agree to work with them to make sure they align with my food beliefs and standards. Jovial Foods is one of those companies. Check out their products, they are good peoples. I am overly joyed to be working with them. This product would make a great gift for the chef or inspired cook in your life! You can order a 3 pack for $60 (that’s a 20% savings) and it’s their most recent harvest of this olive oil. It was harvested and milled just this past fall. The offer is happening through December 31st and orders will ship as soon as the product arrives here in the US at the beginning of January. How cool is that? So cool. You can also order different sizes here in the Jovial Foods Store. Today we feature this beautiful product from the rolling hills of Italy. 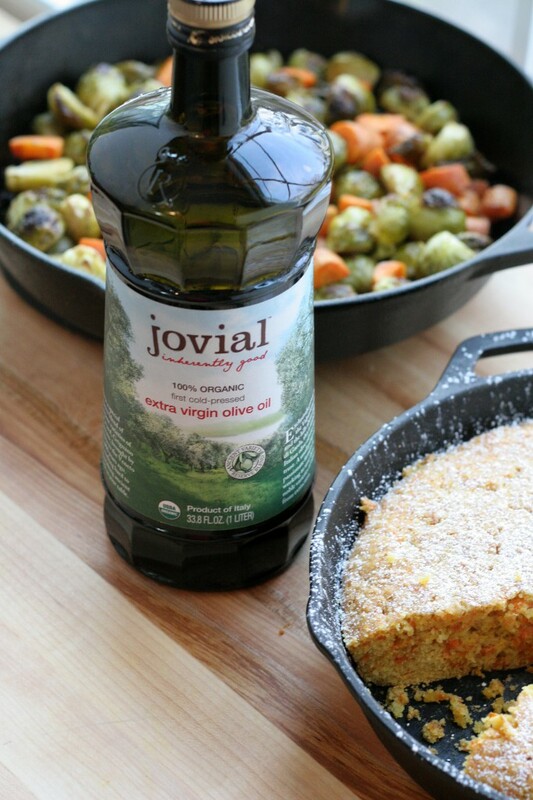 Jovial is a food company that offers a variety of products, one of which is a aromatic, light, fruity, and flavorful olive oil. As soon as I received it I knew I’d like it, the packaging alone is to die for, as I popped open the bottle I realized what a beauty I had on my hands. I immediately smelled a light citrus scent, and tasted it right off the top. It is subtle olive oil, a perfect balance of three different varieties of olives, Favarol, Grignano and Nostrano. Strong enough to taste olives but not too overwhelming to over power a dish. Balanced. Made from the hands of Italians in Italy in an olive oil making facility where nothing else is made but organic olive oil. Assuring an allergy free product. These olives are ancient that came from the Romans and are rare. It is such good olive oil, the Italians use it themselves, which is a good testament to it’s quality. Olive oil varies from region, types of olives used, growing climate, processing, and temperature while processing. That is why olive oil is so distinct and as unique as cheese and wine. You will see cold pressed, first press, blends, and added oils. Countries all over the world rival one another over who’s oil is the best. Which is the same argument people have over wine and cheese of course. Once I started my culinary journey, I realized each country has a unique oil to offer, leaving me with the conclusion, no one county has the best oil. You can find amazing olive oil from all over the world. However, each olive oil is so different that different that I judge it based on taste and quality. Olive oil is also used for so many different applications in the kitchen. Some people like to buy oils for salad dressings versus cooking and baking. I typically buy oil based on flavor and use it across the board. I know when I am making an olive oil cake I will need a strong oil to come through in the finished product. The subtle fruity and citrus notes of this blend lends itself to a variety of uses in my kitchen which is what I like most about it’s flavor. I tested it’s flavors by baking an Citrus Olive Oil Cake, making a simple salad dressing, a marinade for vegetables, and simple vegetable cooking and roasting. I am happy to report total success! First, I baked a beautiful olive oil cake that had citrus in it which complimented the citrus fruity notes of the olive oil. The oils clean olive taste didn’t over power the delicate cake, it added depth to the flavor, which I love in an olive oil cake. Second, I rarely buy salad dressing, so having a good olive oil on hand is a must in our home. I made a simple dressing with rice vinegar, ground mustard, salt, pepper, and Jovial Olive Oil. It was nutty enough to stand up to the acidity of the vinegar and mustard, and fruity enough to make the dressing a touch sweet without adding sugar or honey. Last, I took the simple salad dressing and doubled it as a marinade for roasted brussels sprouts and carrots. I make roasted vegetables a lot, but this was by far the most delicious dish yet. I am obsessed with the flavor of the oil that came through and how it married so well with the simple ingredients of the marinade. I am very happy with the results I got from baking, sauteing, and roasting that I got from this oil. It is impressive without a doubt. It is so important to me to work with companies with integrity, high standards for food, and over all good practice. 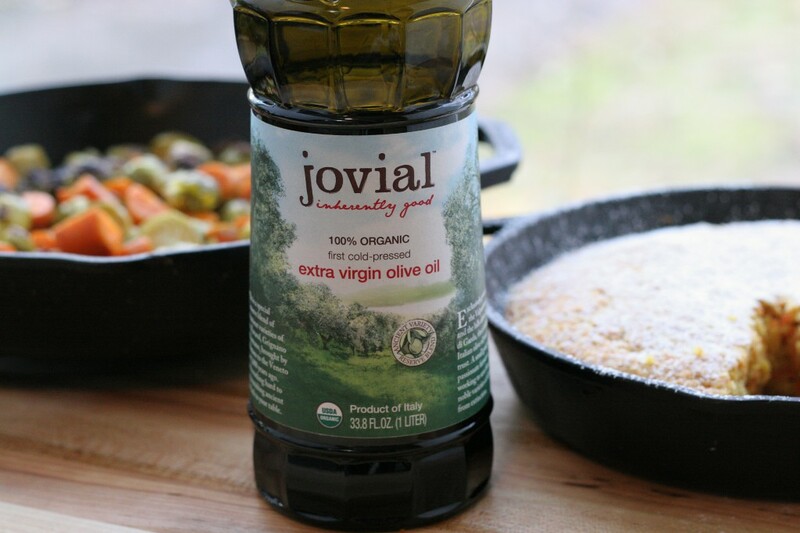 I can happily say I look forward to working with Jovial Foods, using their products in the kitchen on a daily basis, and expanding my knowledge of their what they have to offer. I was refereed to Jovial via an amazing fellow blogger that I am forever grateful to for introducing me to this company. Simple stated. Their olive oil is high quality, using good ingredients, and a good price for what you get. This post is sponsored and I received the product for review, as well as compensation for this post. As usual my opinions are all my own. 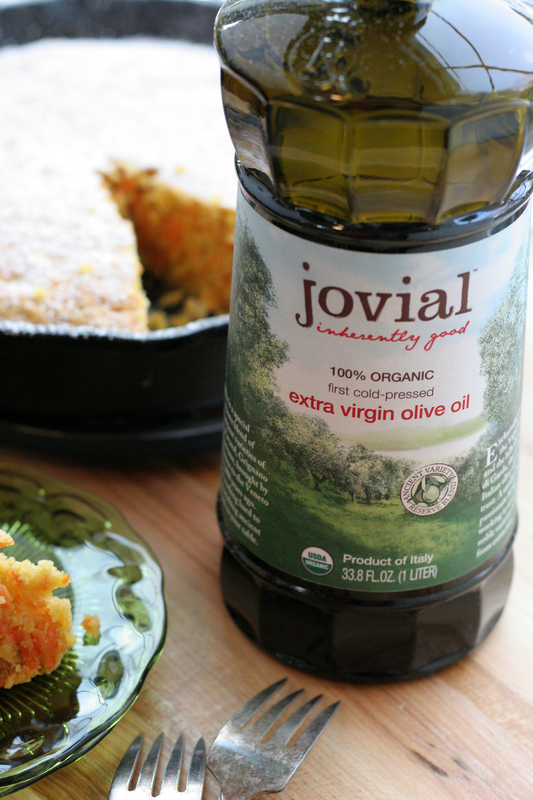 Be sure to watch the video at the bottom of the olive oil page on Jovial.com, I love it!